↑ Sources vary in how Mozart’s name should be pronounced in English. Fradkin (1996), a guide for radio announcers, strongly recommends [ts] for letter z, but otherwise considers English-like pronunciation fully acceptable; thus /ˈwʊlfɡæŋ æməˈdeɪəs ˈmoʊtsɑrt/. 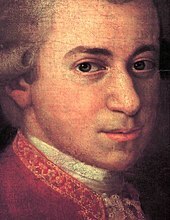 ↑ Mozart's exact name involved many complications; for details see .